With participant safety being paramount, the Kent County League have decided that due to the current exceptionally adverse weather conditions and the forecast for the next few days ALL matches for Saturday 3rd March are postponed. Please note that this applies ONLY to League and League Cup matches under our jurisdiction and not County or external fixtures which will be subject to a decision of the competition organiser or pitch conditions. Thursday 1 March 2018 – the first day of Spring! This means the matches for BGV Adults, U15s, U8s, U7s plus the penalty shoot-out for the U15s will need to be re-scheduled. For Sunday, all that is on at present is the BGV tournament. Training at Norton Knatchbull is ON Wednesday and Thursday. If the school notify me to the contrary, an update will be posted here immediately. Clubhouse opening hours will obviously be amended and I will update later. 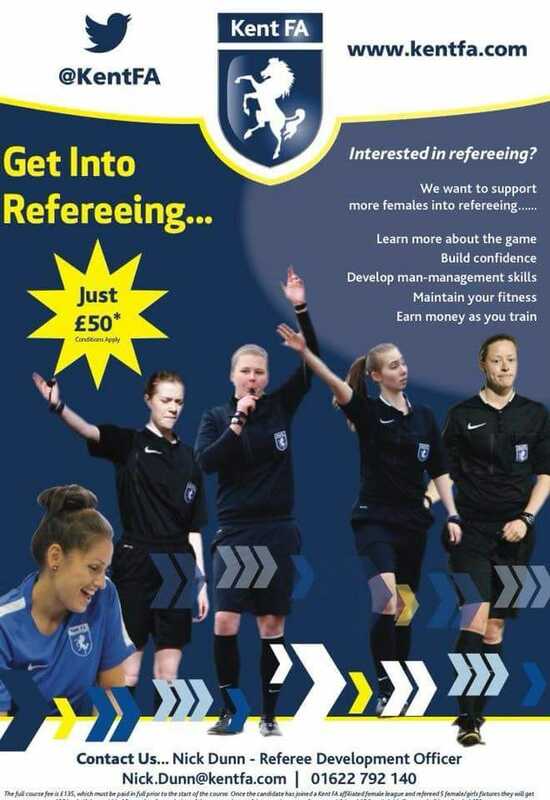 From Lisa: do you want to get into refereeing?